ase call us or email. 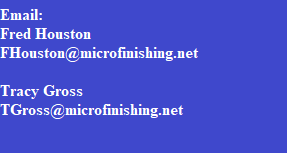 As a leading provider of Microfinishing, we take pride in offering the best service. We are dedicated to serving the needs of our customers each and every day. We had the first patten on the Microfinishing machine. The company was started in the 1980's and have grown since then. You can select from our standard machines to a special retro-fit design to fit your needs.